Colorful, Fun, Airplane Instrument Coaster Set! 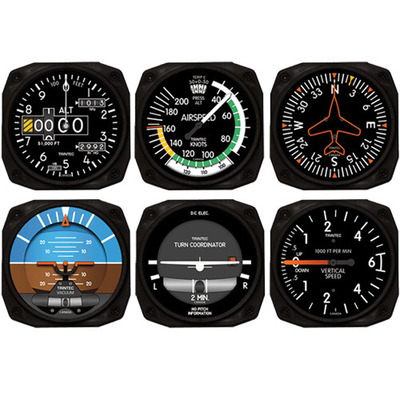 Airplane Gift - This Modern Instrument Airplane Coaster Set is a fun and useful pilot gift. These Airplane Coasters are fashioned after the cockpit instruments found in an aircraft cockpit. The set of 6 include the Turn & Bank Indicator, Compass, Altimeter, Atitude Indicator, Vertical Speed Indicator, and Air Speed Indicator. They are crafted with durable polystyrene, and have a black skid-resistant rubber backing.